Lisbon Humberto Delgado Airport is the latest destination served by Latin America’s largest airline. The services that started last Monday, are operated 5 times a week, deploying Boeing 767 passenger jetliners. Cargo transports are playing a major role on this route, confirms LATAM Cargo. LATAM Cargo is currently expanding its intercontinental network rapidly, evidenced by the new Lisbon service, following their daily Rome-Guarulhos and Johannesburg-Guarulhos flights that stand in their itinerary since last March, both serviced with B767s. Next destination on their route map is Tel Aviv that will connect to Sao Paulo and Santiago de Chile thrice weekly as of December this year, utilizing Boeing 787 equipment. This will be followed by Munich-Guarulhos in 2019, although the start of this route is still pending final decision. The Lisbon flight got off to a good start seen from a cargo standpoint, states Jorge Carretero, senior manager sales, central Europe. He was right at the spot when the B767 took off with 6-plus tons of cargo stowed in their lower deck compartments. Most of the goods, coming from Portugal and Spain, were flown on behalf of logistics giant Panalpina. “It’s a very good customer of ours whome we cooperate with very intensely since long, but the belly-hold capacity of our Lisbon passenger 767 is not blocked exclusively for them,” clarifies Señor Carretero. This way sending a strong signal to the market that his airline invites other clients to jump on board. This accounts for forwarding agents based in central and northern Europe as well, since “we offer scheduled trucking services to feed our Lisbon flights,” explains the manager. Interested parties are offered three products that differ in price: 24h service, 48 service and 72h service. “You decide, we deliver,” he states, adding to this that Guarulhos is a main hub of Latam Cargo. A precondition for enabling onward transportation of shipments to most South American countries and within domestic Brazil, where local LATAM Holding member TAM Cargo offers an extremely dense network, serving a multitude of intra-Brazilian routes. “Brazil is a highly demanded and growing market for European exports as well as for passengers. Being able to offer capacity out of Europe from our 7 and soon 8 hubs including our Lisbon operation will ensure to all our customers a variety of options in order to guaranty speed, consistency and reliability within our network and product portfolio,” comments Guido Henke, Commercial Director Europe of LATAM Cargo. 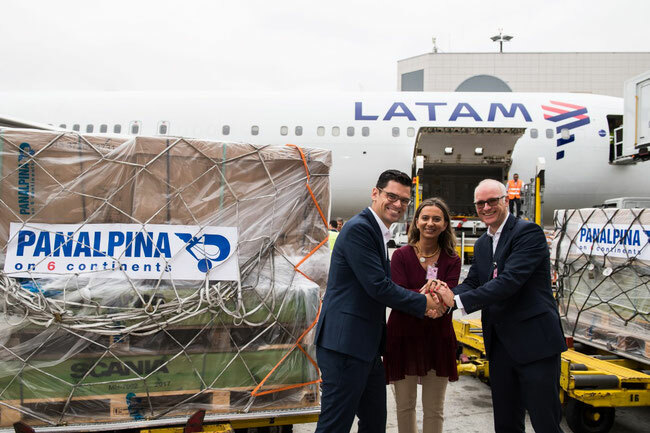 He adds to this that the LATAM Group has opened more than 30 routes in recent years, giving its customers multiple connection options to cut down cargo transportation time. A statement, warmly appreciated by the cargo managers of the airline.